Tooth loss is a common problem for many people. Whether you’ve lost teeth due to gum disease or injury, dental implants in College Park may be a solution. Read on to learn more about the dental implants procedure process and how you can restore your smile and confidence. 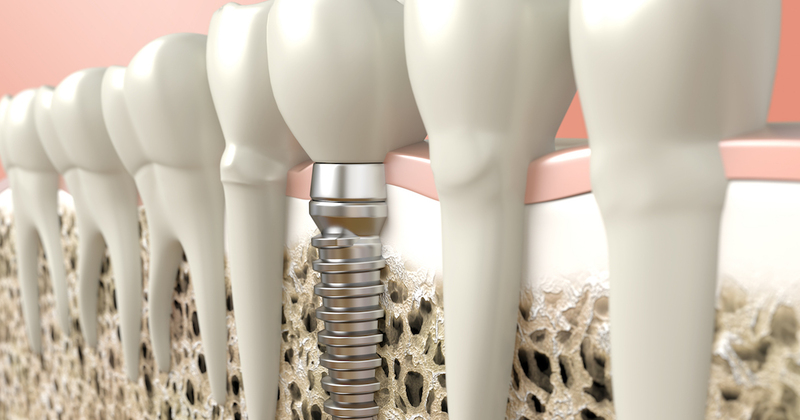 Dental implants are natural-looking replacements for lost or damaged teeth. During dental implant surgery, dental implants are inserted into the patient’s jawbone using small, durable posts. This creates a secure foundation. There are two types of implants: endosteal and subperiosteal. Subperiosteal implants are used when the patient lacks sufficient jaw bone to sustain a bone graft. Endosteal dental implants are placed directly into the jaw bone. The cost of dental implants is decided by many important factors. These include the materials used during the dental implants procedure, the type of dental implants used, and whether any additional surgeries are required. When you meet with your dentist, you’ll receive information on the total dental implants cost. Many patients receiving dental implants in College Park are concerned about the cost. However, when you consider the benefits of dental implants, you may decide the procedure is worth the investment. We provide a variety of payment options, helping patients of all budgets receive dental implants – even without dental implants insurance. Typical insurance plans often lack sufficient dental implants insurance. Many patients come to us with dental implant insurance, but not enough to cover the full cost of the procedure. At our office, we help patients of all budgets afford the cost of dental implants with insurance or without. Let us help you achieve a healthy smile with our affordable dental implants. Call today to learn more about our budget-friendly dental insurance implants options. When receiving dental implants in College Park, it’s important to consider the dental implant procedure steps. The process of dental implants differs slightly depending on the type of dental implants used, but each procedure begins with site preparation. Then, the implant is inserted into the patient’s jawbone. An abutment is added, keeping it securely in place. Lastly, a natural-looking crown is added to the implant. As the surgical site heals, the implant is bonded to your jawbone. Should you have dental implant procedure pain, over-the-counter pain medications and local anesthesia are used. Typically, patients only experience mild pain immediately following the dental implants procedure. We offer a variety of payment options that help make the dental implants cost affordable. If you are ready to increase your quality of life with dental implants, call our office today to schedule a consultation. Caring for dental implants after surgery usually is a simple process. After your dental implants procedure, ease mild discomfort with over-the-counter pain medicines. Dental implants are easily cleaned by brushing teeth daily, flossing, and using mouthwash. Speak with your dentist if you have any additional questions regarding dental implant care after surgery. One of the most common questions we hear from our patients is, “Who needs dental implants?” The answer is simple: People who have lost teeth and wish to restore their health and confidence are candidates for dental implants. When you visit our office, an experienced dentist will examine your jaw’s bone and determine if dental implants are right for you. You will also receive more information about the cost and our flexible payment options. Visit us today to find out if you’re a dental implant candidate. How long does a dental implant last? In most cases, how long dental implants last depends on your oral health and hygiene. Typically, dental implants can last up to 10 years – even longer in many cases. Call us today to learn more about our affordable dental implants procedure.